P.J. Bale, president and founder of First State Inc., has been serving homeowners with complete attention to detail and an unwavering quest for quality since he first began business as PJ’s Lawn Service in 1978. Today, while PJ’s horticultural talents extend solely to the communities the company develops, First State Inc. is committed to a level of craftsmanship that is unparalleled in the industry. Whether it’s full-home renovation or new-home construction, we’ll make your home the home you’ve always wanted. Our portfolio of homes spans the full range of styles and sizes, from high-content starter homes to fully customized executive residences. Yet no matter what the price or size, our homes reflect only the highest level of old-world craftsmanship, new-world materials and out-of-this-world energy efficiency. In addition to individual home building, First State Inc. creates meticulously planned communities with an uncommon level of attention to detail. We do not follow the cookie-cutter approach. By offering a wide choice of basic designs and allowing homebuyers to economically customize their homes to their aesthetic and lifestyle preferences, our communities tend to be village-like settings where the landscaping and architectural variety create outstanding curb appeal and charm. 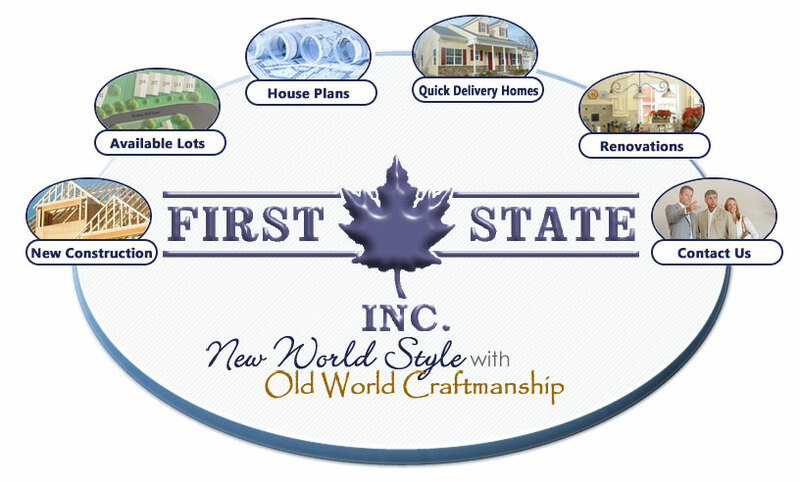 First State Inc. also provides the full range of home remodeling solutions from state-of-the-art kitchen and bathroom makeovers to all varieties of additions and basement transformations. In all cases, you can bring us your plans or we can design it for you. Thank you for visiting our website. We look forward to hearing from you soon.